First wave. Fifth aircraft to attack Möhne Dam. Mine dropped accurately, causing large breach. Aircraft returned safely. Antony Stone was born in Winchester, Hampshire, on 5 December 1920. His father was a barber, and had a shop in the centre of the town. Stone trained as a chef after leaving school, and had worked at several well known London restaurants before volunteering for the RAF in 1940. He was selected for wireless operator training, passing through various training centres, and qualified also as an air gunner. 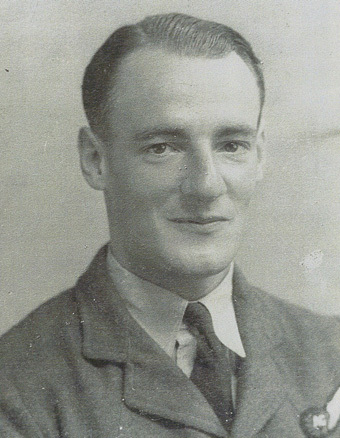 When he arrived at No.10 OTU at St Eval, his path crossed with Vivian Nicholson and John Fort, and they moved onto the final stages of training together, before meeting up with David Maltby at 97 Squadron. On the raid, Stone was responsible for starting up the motor which revolved the mine backwards, and checking that it had reached the correct speed of 500rpm before the aircraft started its bombing run. Four months after the raid, on 14 September 1943, Stone took off from RAF Coningsby on 617 Squadron’s first major operation since the Dams Raid. When their aircraft suffered its final crash it sank with the bodies of all the crew except the pilot, so he has no known grave. When the news reached his family in Winchester, his mother Dorothy was so shocked she was determined to find out more, and set off by train to Coningsby. She was shown into adjutant Harry Humphries’ office in a state of shock, asking him repeatedly: ‘Did he suffer? Did he suffer?’ She then disarmed Humphries by saying that she was glad that there were brave men like him carrying on the fight. As he noted in his autobiography, sadly, the only battles he fought were against official letters and forms. I will have ended happily, so have no fears of how I ended as I have the finest crowd of fellows with me, and if Skipper goes I will be glad to go with him. He has so much more to lose and more responsibilities than I and you can rest assured and know that I’ve taken hundreds with me who lived as you do and never even gloried in the war as I did and I still experience that same thrill every time I fly. His father kept his photograph in his shop until the day he retired, and it is still recalled by generations of boys and men who had their hair cut by him. Antony Stone is commemorated on the Runnymede Memorial.